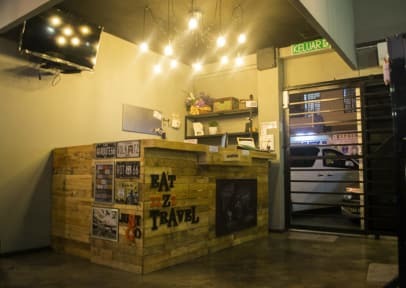 B&B@21 i Kota Kinabalu, Malaysia: Reservér nu! Any cancellation received within 7 days prior to arrival date will incurs the the first night charge. Failure to arrive at the hotel will be treated as a No-Show and will incur the first night charge. MYR 30 will be charged for an extra bed. Upon checking in, guests are required to pay MYR 20 deposit which is refundable upon check out if there is no damage done. 7 rooms dormitory are furnished with bunk beds and all guests share bathrooms with hot shower. 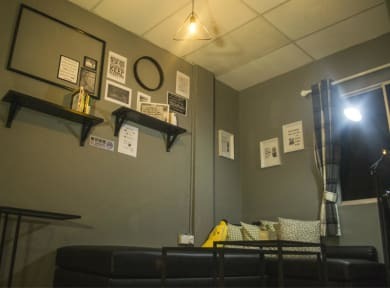 Our dorm are able to host up to 42 guests, and it has one king size bedroom for 2 persons, making it an ideal choice for small group travel for students, families and SME team building trip. Our dorms are varied from 8-beds, 6-beds and 4-beds dorms separated for male and female. All dorm rooms are feature air-conditioning, fan, personal reading light and socket plug at each bed. Beside that, we also provide a TV in the lobby, and free WiFi in the public areas. We offer daily complimentary breakfast and cooking facilities for our guest to prepare their own meals as lunch and dinner are not provided. Not in mood to cook? worry not as our 'home' is just a walking distance from many restaurants and cafes in the area. For safe keeping documents, we provide lockers for our guest to use. 1. Reception operates from 7 a.m. to 11 p.m.
4. Please inform us in advance of your arrival time if you wish to check in earlier or later than this time frame. 5. Card and cash both welcome when check in at the property. 6. At least 3 days advance notice for free cancellation. 7. Upon arrival the guest only need to pay extra MYR 20 for deposit (refundable upon check out). 8. Our property is not suitable for infant / children below 5 years old. 9. Teachers / parents / legal guardian needed for child below 18 years old. My friend and I stayed at b&b at 21 for two nights. From the beginning we arrived late and the staff were welcoming and helpful. They assisted us with booking a great rafting location which was for the next day. The atmosphere of this place is awesome and feels very homely. All facilities are clean, well maintained and aircon rooms! The price is great for such great service. We recommend anyone to stay here as it is the best hostel ever!! Very nice hostel. Staff is very helpful, hot showers, good beds. Friday and Saturday there is a night market very close :) Breakfast is bread with jam/butter.